Recently I did a POC with BAM 12c at the customer. In a series of post’s I will describe my findings/experiences. 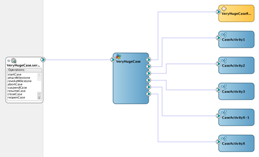 We have an ACM composite consisting of a case with associated BusinessRule component and different BPM processes implemented as Case Activities. See figure below. This is one single composite application. This means that there are two objects for BAM (‘VeryHugeCase Activity’ and ‘VeryHugeCase Process’) generated in the ‘Process Analytics’ project. Read the complete article here.